"A delicious option for homemade pizza! 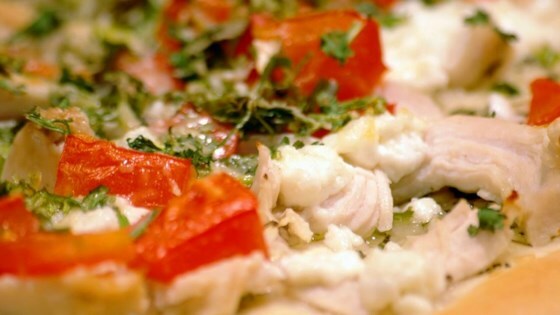 Butter garlic sauce, chicken, tomato, and ricotta and Parmesan cheeses are baked together for a delightfully light pizza." Place the chicken breast in a saucepan with enough water to cover. Bring to a boil, and cook until no longer pink, about 20 minutes. Drain and cool slightly, then cut into strips. Meanwhile, in a small skillet over medium heat, melt the butter with garlic, onion and basil. Pour into a chilled dish to cool, and refrigerate until set. Roll out the pizza dough, place onto a pizza pan or other baking sheet, and spread the herb butter over the surface using the back of a spoon. Arrange chicken on top, then dot with ricotta cheese. Top with tomato slices, cilantro and Parmesan cheese. Bake for 15 to 20 minutes in the preheated oven, until crust is browned and center is cooked through. I used with bobboli. Maybe it would be better with the refrigerated dough. I also should've seasoned the chicken, the pizza was bland. Will probably not make again. Excellent! I used 2 chicken breasts and cooked them in the butter/garlic pan. Also added a little mozzarella cheese. Would make a great appetizer if cut into smaller pieces. This is a very tasty recipe! The herb butter adds a great flavor to the pizza. It’s a nice change from the “traditional pizza”. You can really personalize this with any topping you like.